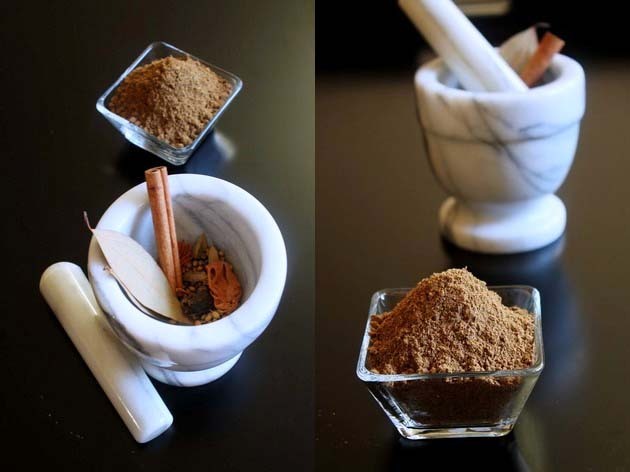 Garam masala powder recipe – a unique ground spice blend from India. It is found not only in every Indian household pantry but also found in the pantry of those who fond of cooking Indian food. It is combination of different spices and ground into powder form. Garam means hot. But this term hot is not same as hot chilies. It increases the body temperature in good way which is good for your health and digestion. Every household has their own way of making this masala. The spice proportion and method may vary from recipe to recipe. This is my mom’s recipe and she got it from her mom. As I do not have dried ginger, I have used dried ginger powder here. If you get your hands on dried ginger pieces then please use that. 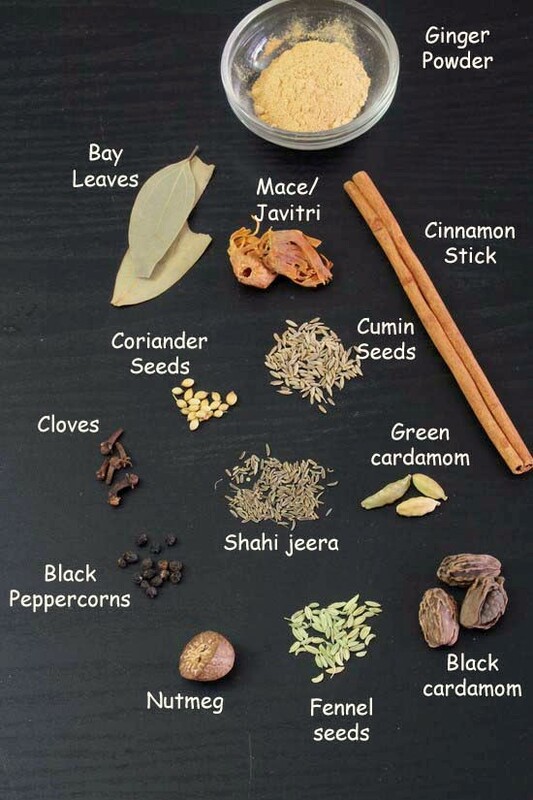 Here are all the spices used in making Punjabi garam masala recipe. Here I have lightly roasted the spices before grinding which makes aromatic masala. You can make it without roasting as well. But I like to roast it very lightly so it removes moisture from spices if it is present in them because of the humid weather. My grand mom used to sun dry them for a day instead of roasting. But here in east coast of USA, sunlight is very rare during this season. 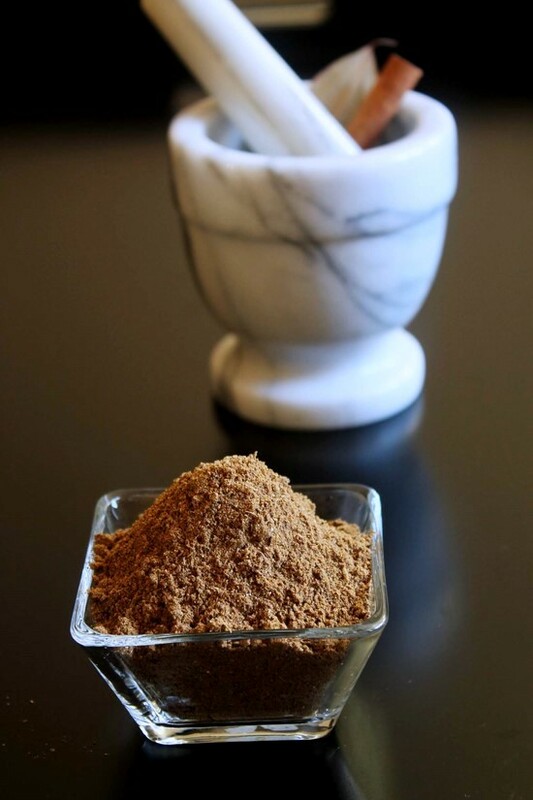 Homemade garam masala powder is much better tasting, fresh and aromatic than store bought. 1) Take all the spices except dried ginger (whether its whole or in powder form) in a pan. – I had long piece of cinnamon stick so break them into pieces. 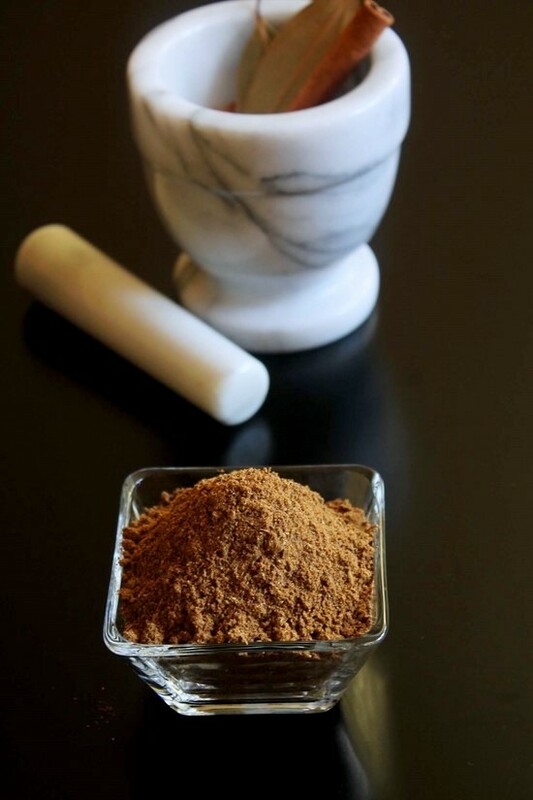 – Also break the nutmeg into small pieces using mortar and pestle. 2) Turn the heat on low and roast them with stirring continuously for only 2-3 minutes. Spices are just barely warm. we don’t want to brown them or color them. 3) Remove it to another plate and let them cool down to room temperature. Most important, let spices COOL completely. If not cooled then you will have lumps in your ground masala. Those lumps are slightly wet means it has moisture which decreases the shelf life. 4) Then grind them along with ginger in batches in spice grinder or coffee grinder into fine powder. Keep grinding the batches and remove to a bowl or plate. At the end, mix everything well. 5) during the grinding process, this may get slightly warm. So again let it cool down in the plate for some time. Then store in the container. Storing the powder: Store in clean, dry, airtight container. It stays good for 6-10 months. It stays fresh and good upto one year, if stored in airtight container or jar. Always use clean spoon (not wet) while taking out from the jar. I usually keep it in big jar and remove 2-3 tablespoons in my spice dabba which lasts for a week or two. So every time I am cooking, I am not going to open the jar, so aroma and freshness stays intact for longer time. Serving Suggestion: Add 1/4 to 1/2 teaspoon of it into 2 servings of sabzi or dal. Always add garam masala powder at the end of cooking means once vegetables are cooked or dal is boiled. By doing so dish stays aromatic and flavorful. Homemade one has stronger flavor than store bought one. So if recipe calls for 1 teaspoon of garam masala powder, use ½ to ¾ teaspoon of homemade one. If using store bought then use 1 teaspoon. Take all the spices except dried ginger (whether its whole or in powder form) in a pan. I had long piece of cinnamon stick so break them into pieces. Also break the nutmeg into small pieces using mortar and pestle. Turn the heat on low and roast them with stirring continuously for only 2-3 minutes. Spices are just barely warm. we don’t want to brown them or color them. Remove it to another plate and let them cool down to room temperature. Then grind them along with ginger in batches in spice grinder or coffee grinder into fine powder. Keep grinding the batches and remove to a bowl or plate. At the end, mix everything very well. Store into a jar or airtight container to keep it fresh. Thank you for the recipe. It was very well received at our dinner club. Can you guess what the theme was? Your guidance was excellent. I guess theme is Indian food. LOL !!! 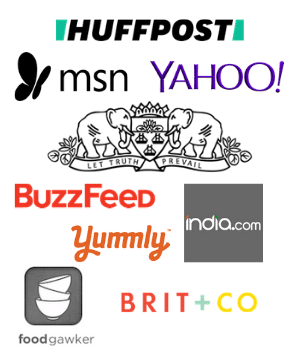 Anyways, very glad to know that site and recipes are helpful. Hi there! I tried out this garam masala recipe, with a few variations, and absolutely loved the result! Can i use nutmeg powder instead of whole nutmeg? If yes, how much quantity? your Dal Tadka & tikha gatiya really superb……..